Earn $8.18 in Rewards credit. Click to learn more. Sometimes the right choice is not to decide between two options but instead to reach for both. The Crank Bros Double Shot Pedals are half clipless / half platform for a high level of versatility on the road, trail, or commute. 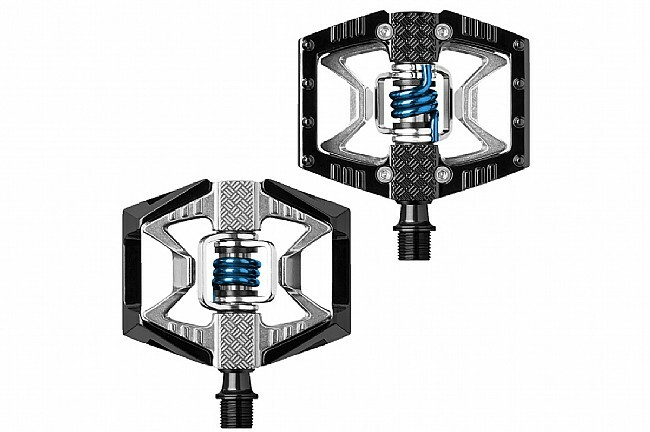 These hybrid pedals use Crank Bros' beloved stainless steel Eggbeater mechanism on one side, giving them reliable retention, simple operation, and unparalleled mud-shedding ability. On the other side the pedal features a wide, flat platform with molded-in pins and ribs for superior grip, and the alloy body is lightweight while still being durable enough to withstand the inevitable obstacles of everyday riding. A chromoly spindle spinning on a custom inner igus™ LL-glide bearing and outer Enduro cartridge bearing increases longevity over previous designs, and they're protected using an improved double-seal system to keep moisture and muck out.